On Thursday WEN staff, volunteers, and interns received a Level One Certifications in Volunteer Water Monitoring Training from Montana Watercourse. We learned a different method of testing for dissolved oxygen and pH and we tested out a flow meter. Thanks to all the people who came out to the training and to our trainer Kathryn Watson. Tuesday evening WEN showcased our programs at the Missoula Federal Credit Union Sustainability Fair. Young and old flocked around the groundwater flow model and one of our newly finished aquatic macroinverts! Thank you volunteers! Early Wednesday, WEN headed up to Seeley Elementary School and met Patti Bartlett's 7th and 8th grade classes at Morrell Creek to collect water chemistry and aquatic macro invertebrate data. Houston Thompson has been interning with the Watershed Education Network since Fall 2009. With WEN, he has been working with the large amount of data collected on streams and rivers over the years. Under the guidance of Tony Berthelote, University of Montana grad student, SKC faculty and WEN volunteer, Houston has picked up on the end of a long running monthly well monitoring project. The monitoring is associated with a larger study on the Milltown Dam removal through the Geosciences Department of the University of Montana. The monitoring started long before the dams removal to study the effects of the drawdown on groundwater. 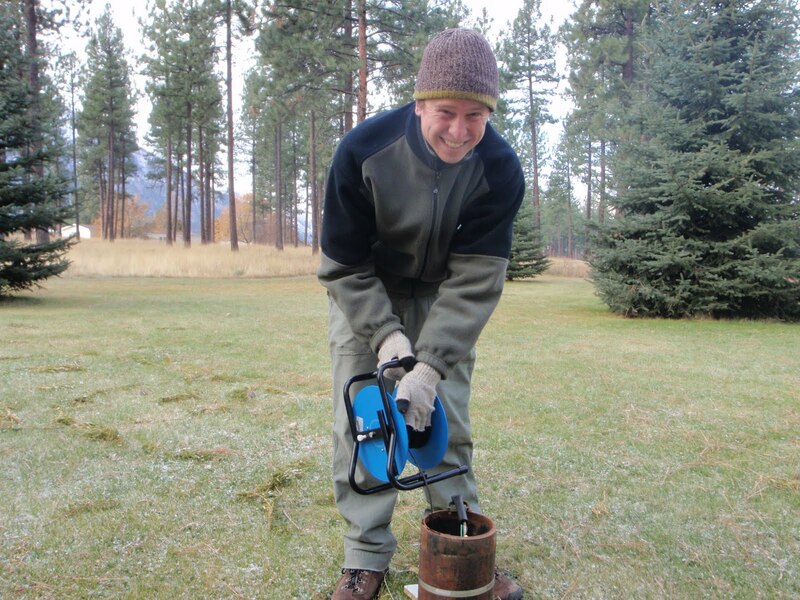 Last weekend, (March 19th and 20th) in addition to the monthly hand measurements, two dozen data loggers (ducers) were uploaded from about 50 wells focused between East Missoula and Turah. The ducers provide conditions in the wells in two hour increments, since the monitoring last November, and will continue to provide data until the project terminates. The results confirm the low water table as normal in the area for March, with a few signs of the beginning of spring melt. Recent chemical and bacterial lab tests on 20 samples had good results as well. Funding for this particular monitoring project runs out in June, but the experience and the quality data collected will last long after. "Water is a limited resource that requires care"
Aquifer, geology, groundwater, infiltration, pollution, the life of a water droplet-these are topics that Krista Drendel & Rocío Muhs's K1 students at Missoula International School investigated during their class visit from Watershed Education Network. Students got the opportunity to travel the world as a water droplet in a Project Wet game called The Incredible Journey. Program Director Josh Gubits engaged the class in thinking about the water beneath our feet with the groundwater flow model. Students excitedly watched and made predictions as the aquifer was "polluted" and water was drawn from different wells along the aquifer. Then the class headed outside to build their own groundwater experiment. First they decided what they wanted their aquifer to do with the water, then they predicted which layers to add (clay, sand, stone, dirt) and in what proportions. Students observed the amount of filtration and the time it took for water to flow through their aquifer. Sometimes the most amazing things happen when you say ‘yes’ to new learning experiences…. Tony Berthelote, the SKC Natural Resources Faculty member who is working with WEN to encourage more Native American students to study environmental sciences had a great invitation for us, but until we arrived in Minnesota, we didn’t really understand just how great of a learning experience we were in for. He told me about the incredible National Water Lab at St. Anthony Falls, gida Camp in the Minnesota woods and the enthusiasm of the Minnesota students and the dedicated teachers. It sounded like a great model to go see and experience. Through email, the trip arrangements were made and we were an unlikely western Montana team: SKC Natural Resources chair, Bill Swaney, undergraduate student in Natural Resources, Austin Moran, Tony Berthelote, Two Eagle River School science teacher, Allen Bone, Bonner School gifted teacher, Bill Stockton, two Bonner School seventh grade students, and me, Director of Watershed Education Network. We arrived at the Missoula airport at 6:15, just in time for the breakfast meeting with Bonner School seventh grade students, Jonathan Taylor and Riley Slayden and their parents. They were interested in hearing all about the schedule and the places we would go. Lift off. We arrived in Minneapolis and were greeted by Diana Dalboton of the University of Minnesota’s St. Anthony Falls National Lab. She was our tour guide for the days in Minnesota. Diana arranged for lunch and a whirlwind tour of the six stories of water studies in the National Lab. We saw room-sized models of river channels where river flow was studied, delta formation studies in huge models, and sediment deposition studies in gigantic tanks of flowing river water. The favorite was the wind tunnel, where wind velocity studies were taking place. We took pictures of the gigantic falls and Minneapolis across the river. We headed north to Cloquet, where we would go to the gida Camp in the woods and join students and teachers on their weekend science camp. According to the website, gidakiimanaaniwigamig seasonal camp will host the manoomin project, a study of the wild rice lakes on the Fond du Lac reservation. The Fond du Lac Natural Resources Department is working with the University of Minnesota LaCorre Liminological Department, the Fond du Lac Tribal and Community College to take lake cores from 6 wild rice lakes over a period of five years. Information found will be shared between the University, College and Reservation to better understand the history and future of wild rice. The study was a partnership with Fond du Lac Natural Resources Department and Fond du Lac Tribal and Community College put the students in research projects with the scientists. They meet at the gida Camp one weekend a month to continue their teams’ lake or sediment research. We were greeted warmly by Holly Pellerin and Lowana and graciously introduced to everyone, then herded off to dinner, one of our first amazing meals of the weekend. Each meal began with a Native American blessing and followed by a tradition of elders eating first, followed by high school, then younger students. The aura of respect for tradition and one another was tangible throughout the weekend. The high school students showcased their research with a slide presentation, with teams taking turns describing their projects. It was great to see girls and guys sharing leadership and showing confidence in their science projects. Saturday, we went to robofest at a local elementary school gym! Incredible array of students from middle school to high school in contests to see which programmed robot would make the obstacle course set out in the competition. One of the gida Camp fourth grade students had her lego airplane, programmed to have the propeller spin, on display. We left Robofest in time to stop by the Fond du Lac Community Center and drive up to Duluth to see where the St. Louis River flowed into the ice-jammed Lake Superior. Through the mist we saw the dark blue water that extended past the horizon with waves and white caps out in the distance. Near shore was the cartoon-like ‘pancake ice’ or ice that formed through the wave action on the lake. It was a stunning view. Sunday morning the sun broke through and said fond farewells to our new Fond du Lac and gida Camp family. We drove in sunshine back to Minneapolis where Diana had arranged for a special time at the Minneapolis Science Museum. We met one of the map builders, Paul who showed us some special maps of the earth created to cover a gigantic part of the museum floor! As our plane carried us back to the mountains, we were all thinking about how to bring the rich and dynamic gida Camp model to Montana or at least bring our new friends and family out west to see and experience our lakes, forests and science research! Trained and ready for the field season! Thanks to everyone who came out to our Stream Monitoring Training on Saturday! We had a great time meeting new friends and learning new things at the creek! If you would like to volunteer with us, check our WEN calendar and contact water@montanawatershed.org. WEN was blessed with a beautiful day for our spring Stream Monitoring Training last Thursday at Greenough Park. WEN's MTCC Campus Corps volunteer coordinator Alaina Strehlow taught community members how to test multiple chemical parameters and WEN's Field Director Josh Gubits lead the aquatic macroinvertebrate station. The group also learned how to measure a cross section of the stream and calculate velocity and cfs. The trainings are primarily used to train potential volunteers for our School Stream Monitoring Program and our Stream Team. Community members who are interested in doing their own independent stream monitoring are also welcomed to use WEN's water testing equipment after attending a training. One of the best moments of Thursday's training was when children playing in the park came over to our biological station and asked to look at the bugs we collected. Volunteer Water Monitoring Training! Saturday March 13th (1:00p-5:00p) @ Greenough Park Pavilion: Open to the public! Come learn about the Watershed Education Network and how to test the biological, physical, and chemical parameters of stream health. Or come for a refresher course, and to catch up. Then join us on school stream monitoring field trips though out the season! For directions see the map link or call 541-9287. On the day of the training call Josh at (303) 204-2483.